The aim of this guide from the Irish Sea Fisheries Board (BIM) is to provide practical and contemporary guidelines on the handling and quality of mackerel, at all stages, from capture to the first point of sale. The objective assessment of quality is vital to enable industry agree and implement common trading specifications. Defining quality is not easy, as it can include a range of factors, which depend on market preferences such as: species, size, capture method, seasonal condition and freshness. Of major importance to all consumers is freshness, a characteristic, which relates to the degree of spoilage a fish has undergone. Very importantly and unlike many other quality attributes, this is something that the fishing industry has certain control over. Pelagic fish, such as mackerel, are much more susceptible to spoilage than whitefish species for several reasons. Under poor cold chain management, fast acting enzymes in the stomach, quickly digest the stomach wall after death, leading to rapid internal spoilage. Under similar conditions, the high fat content of the flesh is quickly oxidized, adversely affecting the taste and quality of the flesh. External spoilage also occurs on exposed surfaces in undesirable conditions and increases in rapidity as fish size decreases. As a result of good manufacturing practices, spoilage at all stages in production and processing can be assessed and minimised. Tests used to regularly assess the freshness of mackerel include the determination of histamine and total volatile base nitrogen (TVBN). Elevated levels of histamine can be indicative of bad handling practices and temperature abuse and are of importance to human health, as they can cause histamine poisoning in sensitive consumers. TVBN is used as an index of freshness. It measures the key products of bacterial spoilage (ammonia, dimethylamine and trimethylamine) from a sample of fish and is carried out using specialised laboratory equipment. Refrigerated Sea Water (RSW) tanks should be pre-chilled to 0ºC prior to receiving fish at sea. The ratio of fish to RSW should be 80%: 20%. 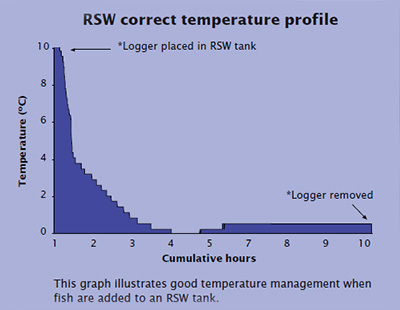 Fish should not be discharged from RSW vessels, where their core temperatures are above 4ºC. Keeping fish in chilled RSW tanks is the most effective means of storage in order to maintain quality. Fish should only be discharged from the vessel when the processors are ready to process the catch. Only numbered, clean, undamaged bins should be used to enable batch identification at the processors. 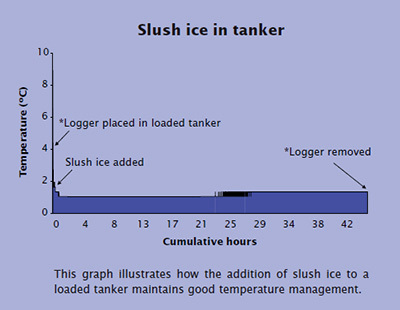 An appropriate ratio of pre-chilled water and brine to fish should be used in tankers transporting fish from RSW vessels to processors, in order to maintain the temperature of the fish or facilitate further chilling during transport. Adequately chilled tankers or bins should be transported to the processors immediately. The temperature of fish in transit should be regularly monitored and appropriate action should be taken to ensure that correct core temperatures are maintained. The temperature status of batches, upon arrival at the processors, should be recorded. Immediate action (the addition of ice or refrigeration) should be taken, if required, to reduce batch temperatures to acceptable levels. 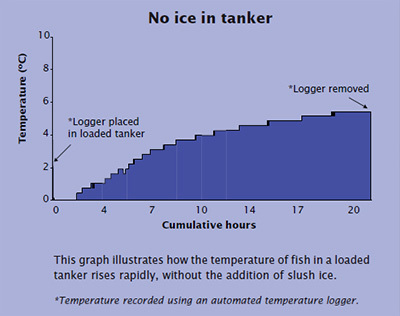 Fish should be rapidly processed to minimise storage duration in tankers or bins. Regular temperature checks should be undertaken of fish in storage, to ensure that the correct chill chain management is maintained. Adequate traceability should be implemented to allow batches with different time-temperature histories to be identified and segregated at processors. It should be possible to trace each batch back to the vessel for product recall purposes. Photocopy the assessment sheet to enable scores to be recorded. Take a random sample of ten fish and score each one separately. Take one fish and assess each quality category i.e. Eye, Body Colour, Rigor etc. separately. Look at the first category, Eye, and decide which description matches the fish you are examining i.e. the Very High, High, Medium, Low or Very Low column. When one of the five options has been chosen, place a tick in the shaded box directly below your choice. Now move to the next quality category, Body Colour and repeat steps 4 and 5 for this category and all following categories for the fish. You now should have one tick for each quality category. Repeat steps 3-6 for nine more fish, ignoring any previous ticks from other fish examined. After examining all ten fish, you should have a total of ten ticks for each quality category. Now look at your columns i.e. Very High, High, in turn. Add all cells in the column and put the resulting figure into the space at the bottom of the column. Multiply this number by the appropriate weighting for the column, which is 5, for example, in the case of the 'Very High' column. Repeat steps 11 to 13 for all columns. Add the multiplied column totals and divide this number by 10 (the number of fish used) to achieve the average numerical quality score for the fish examined. Divide the average score by 35 (maximum average score possible) then multiply by 100 to achieve the percentage score. This percentage score can then be changed into a quality grade using the scale provided (i.e.>80%, 80-60%, 60-41%, 40-21%, 20-0%). Repeat the same procedure described above for the market specifications. Note the approximate number of parasites (nematode worms) and their location (fillet, gonad, liver).